Matti DiFebo spent over 4 years with the UCF Athletic Association where he pioneered and developed the "best practices" ticket sales model for collegiate athletics. 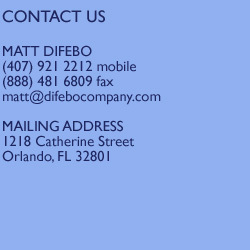 After founding the DiFebo Company LLC, UCF retained DiFebo's services as a consultant. In the first full year of operation, the UCF athletics newly implemented sales program generated over $2.3 million dollars more than the previous season. Matt DiFebo's expertise has helped the program double its basketball ticket revenue and season tickets sold. DiFebo was brought in to perform a situational assessment and Level 1 Sales Training. Matt has consulted with DU's athletic and recreation departments to identify revenue opportunities and set strategies and goals.